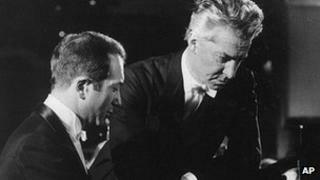 Bulgarian pianist Alexis Weissenberg, hailed as "one of the greatest performers of the 20th century", has died aged 82. Born into a Jewish family in Sofia, Weissenberg began piano lessons at the age of three, giving his first public performance when he was eight. Bulgarian national radio reported he died on Sunday in Lugano, Switzerland after suffering a long illness. Culture Minister Vezhdi Rashidov called Weissenberg a "piano virtuoso". Born in 1929, Weissenberg was initially taught to play the piano by his mother. When he was 10, they both attempted to flee the rise of European fascism for Turkey but were caught and sent to a concentration camp. They were saved by the young child's skill on an accordion which was a present from an aunt. A German guard who liked music let Weissenberg play and after three months put the Weissenbergs on a train to Istanbul. He studied at the Jerusalem Academy of Music and performed with the Israel Philharmonic under Leonard Bernstein before entering New York's Juilliard School of Music in 1946. Weissenberg spent 10 years touring Europe and the US and, in 1956, moved to Paris where he would spend the next decade studying and teaching. Recording throughout the 60s and 70s, Weissenberg will perhaps be remembered most widely for the Rachmaninoff and Tchaikovsky concertos he recorded with Herbert von Karajan.